No matter how talented, educated or skillful one is, there is no way he or she can achieve success completely on their own. That what makes people unite into communities -- groups of people with the common needs or preferences, beliefs, resources, etc. Online store owners unite into communities too, often gathering together on internet forums, or message boards. Those forums are perfect places to hold conversations, ask for help and provide help for others, discuss each other’s problems, share experience, make new business contacts or simply have a cosy chat. We, as a part of such communities too, highly recommend you to join them immediately. Here, we’ve gathered a list of a few some of the most remarkable and developed internet forums for online store owners. Shopify Forums. Even though Shopify Forums is dedicated to…. well, Shopify, it offers a plenty of help for all online merchants out there. With more than 52 000 of topics created, the Shopify community has covered nearly everything concerning e-Commerce that may come into your mind. The best thing is the fact that unlike the majority of other message boards, Shopify Forum is continue to actively develop and add up to its value. PrestaShop Forums. PrestaShop has been always prioritizing and emphasizing the fact it has “one of the largest ecommerce communities in the world” framing it as one of the platform’s main advantages. Well, the first time you visit Presta forums, you realize it’s definitely not a marketing trick. The community forum is massive storehouse of knowledge with more than 2 million of posts and boards for a variety of languages, including French, Spanish, German, Polish, Italian, Vietnamese, and Russian. WordPress Support Forum. 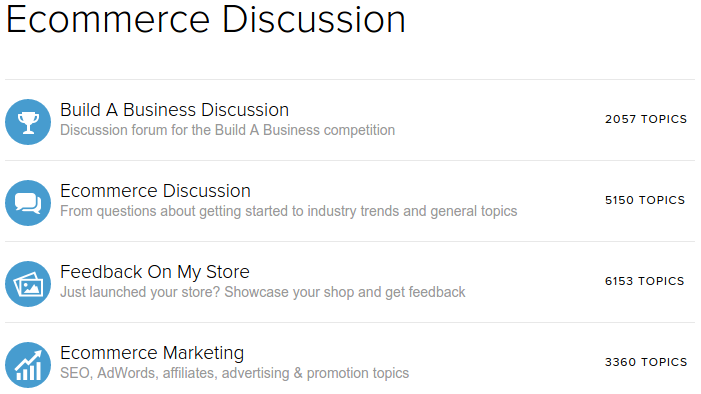 If you’re running a store on WooCommerce -- or any other e-Commerce plugin for WordPress -- this forum is a must for you to visit. Whatever issue or question you have, you’ll get everything answered and explained by those who know. Even though it's basically useless for merchants using other CMSs, concerning the popularity of WooCommerce lately, we could not ignore including this resource to the list. Magento Forums. What else we’re missing? Magento forum! A mecca of all Magento users, the place where questions are getting answered before they rise. It’s especially valuable in terms of solving technical issues, since the majority of users are not only Magento users themselves, but experienced developers too. Warrior Forum. Warrior forum is, perhaps, one of the most extensive message boards for internet marketers, online entrepreneurs and online store owners. Beside SEO, SMM and email marketing sections, e-Commerce branch is equally developed and being constantly contributed by over 1 million of users (but not all of them are active, ofc). You may also find there a premium section, so called The War Room, the access to which (where are, we assume, tons lot of useful content) will cost you as little as $97 annually. The SitePoint Forums. The SitePoint Forums is a community forum for SitePoint website with lots of useful tutorials and articles for developers, designers, store owners, etc. Also, you may enjoy reading some other boards with topics on social media, marketing and content production. So, regardless of what particular topic you’re interested in, you’ll definitely find there something interesting there. Small Business Forum. This message connects together more than 21 000 of actively contributing entrepreneurs -- experienced or not so much. Launched in 2008, it has become a home and an inspiration for thousands of business ideas and projects. Board categories are Your Small Business, Financial & Legal, Marketing, Your Website, Community Talk, and Forum Business. Digital Point Forums. The Digital Point is a community of webmasters that unite techs, marketers, SEO specialists, programmers, freelancers, developers, entrepreneurs, designers, etc. In addition to an extensive variety of discussion boards, you may also find there a marketplace for digital goods, including sites, templates, extensions, scripts, domains, and plugins. The general chat board alone of this monstrous (monstrously useful) forum accounts for nearly 2 million posts! The Web Retailer Forum. Retailer forum is a wonderful educational resource for online retailers with more than 16 000 active users. Here you may find industry insights, interviews with top e-Commerce sellers, researches, statistics and growth hacking tactics. So if you’re looking for some tips on business development or willing to share them yourself - you’re welcome to join the Web Retailer community! 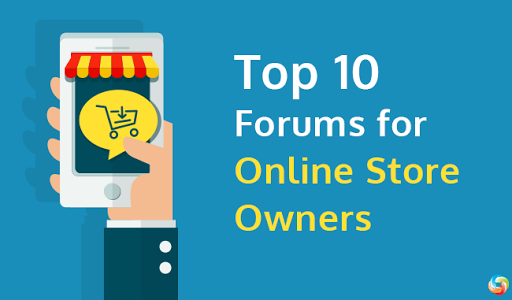 So, this is our list of top 10 forums for online store owners. But we’re sure we’ve missed something… What forums do you think are worthwhile to be included to the list? Feel free share them in the comments below! 6 thoughts on "Top 10 Forums for Online Store Owners"
Thanks for share them, Magento now has become one of the most popular E-Commerce platforms in the market. It’s all thanks to all the features and services. Now, with the arrival of Magento 2, various kind of responses comes from the Magento community. Glad to know you’ve found our writings useful! We’ll be happy to cover topics you’re interested in. Hope to hear from you soon. Thanks a lot for giving us these essential tips about online shopping store. Your information is really very important for us.